Eventmasters are delighted to offer key events throughout 2019 at Tottenham Hotspur Stadium. Many of us are highly anticipating the opening of the Stadium and we can’t wait to see the big reveal. With a capacity of 62,062 and a single tier 17,500-strong home south stand the stadium will be one of the finest in the United Kingdom. Spurs fans can look forward to a match day experience like no other in state of the art facilities that will no doubt provide the perfect backdrop for exhilarating matches. It has also been announced that two of the NFL London 2019 games will be hosted at the new stadium as American Football continues to grow in popularity. The new state of the art facilities at Tottenham Hotspur Stadium promises to provide visitors with an experience like no other. Visitors will be transported to a place full of exciting new technology and brand new facilities. The new features will certainly impress you and your valued clients. Standout elements include the new “In Bowl” experience, which is said to make fans feel closer to all the excitement than ever before. 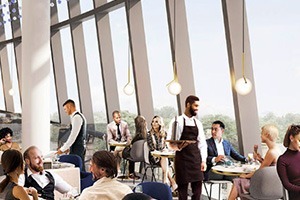 The development includes state of the art technology which will provide, pre, post and half-time entertainment and guarantees the Tottenham Hotspur Stadium will help keep the Clubs infamous electric match day atmosphere. If that wasn’t enough to entice you and your guests to visit then we are certain the new concourse will definitely impress. With more than 60 food and drink outlets, you certainly will be spoilt for choice. The vast concourse allows you to connect with other Spurs fans from different stands or feel at ease with your family in the dedicated family area. The stadium really has thought about each and every one of their fans, ensuring all visitors can enjoy an enjoyable match day experience. Spurs fans will enjoy the wide array of experiences and pop up shops on offer. The Tottenham Experience, the biggest club store in Europe will have fans shopping till they drop with exclusive merchandise, gifts and memorabilia. Here at Eventmasters we are highly anticipating the opening of the stadium and can’t wait to see the luxury facility in full swing later on this year. Mauricio Pochettino’s side is also highly anticipating the arrival of their new stadium. Tottenham Hotspur has called Wembley Stadium their home for the 2018/19 season and no doubt look forward to being able to have a permanent home back. At the end of the 2016-17 Spurs said goodbye to their former home White Hart Lane 118 years on since its opening. The stadium which went on to be one of the most famous venues in the world was unfortunately demolished to make space for the new stadium. The last match at White Hart Lane was one that will be treasured by Spurs fans for a long time. Spurs wanted to leave a lasting memory and beat Manchester United 2-1 in the Premier League. The team itself was originally founded in 1882 and they have had a pretty impressive run over the years. They quickly made names for themselves and secured a place in history as the first club in the 20th century to achieve both the League and Fa Cup double. Another standout achievement marks them as one of the only teams in British Football to have collected at least one major trophy within the six decades that ran from the 1950s to the 2000s. It is these types of victories that have ensured they are one of London’s most successful teams. In more recent times they have finished third in the last three Premier League seasons under the guidance of Mauricio Pochettino. Football is not the only event that can be enjoyed within this brand new development. American football fans can look forward to two NFL London Games this year at the stadium. Alongside Wembley Stadium the venue will look to host an American Football experience worth savouring. With the likes of the Jacksonville Jaguars and Oakland Raiders in the lineup, it will certainly be a day to remember. The stadium will also be offering unique visitor attractions including tours, Skywalks and Museum and Archive access. All of which will no doubt impress the budding Spurs fans amongst you. We are now selling VIP Football tickets and hospitality packages for upcoming fixtures at the stadium. Guests can enjoy a unique experience in exclusive facilities as they enjoy a match day experience like no other. Treat your valued guests to a VIP football experience. We can’t wait for the stadium to open and we look forward to welcoming you and your clients there.